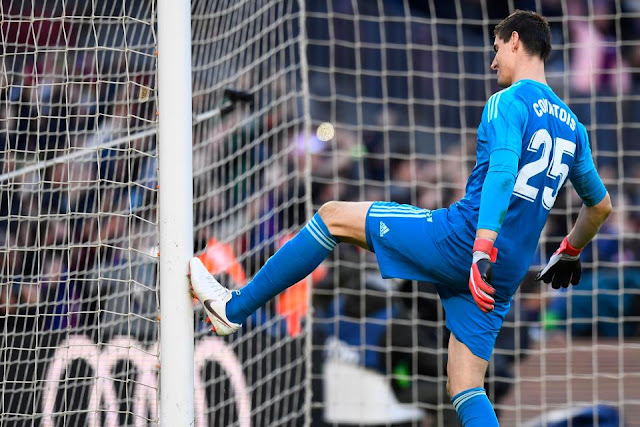 Thibaut Courtois may want to avoid checking his mobile for the next week or so, especially if the reaction of these Chelsea fans is anything to go by. The Real Madrid no.1 conceded five goals on his Clasico debut as Luis Suarez’s hat-trick condemned Los Blancos to a 5-1 defeat at the Camp Nou. Courtois kicked up a storm at Stamford Bridge after falling out with former boss Antonio Conte and demanding to leave. After getting his ‘dream move’ to the Bernabeu, new Blues boss Maurizio Sarri moved to sign Kepa Arrizabalaga from Athletic Bilbao as his replacement. In his place, the Spaniard has helped to take Chelsea maintain their unbeaten start and helped lift them up to second in the table. with a 4-0 win at Burnley. Understandably, several Chelsea fans have little sympathy for former No.1 Courtois given his poor attitude and petulance.